The 76ers win despite their bench being outscored, 61-14. 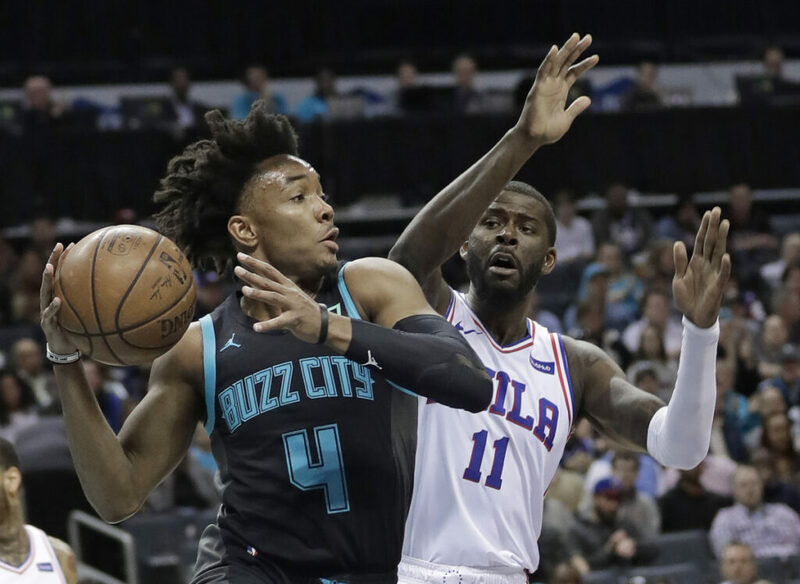 CHARLOTTE, N.C. — Ben Simmons scored 28 points, JJ Redick had 27 points, 10 rebounds and eight assists and the Philadelphia 76ers held on to beat the Charlotte Hornets 118-114 on Tuesday night for their fifth straight victory. Jimmy Butler added 23 points and nine assists, and Tobias Harris chipped in with 22 points and 12 rebounds for the 76ers (46-25), who remained in third place in the Eastern Conference standings. Redick finished with seven 3-pointers, one shy of his career high. Jeremy Lamb led the Hornets with 26 points and 11 rebounds, but missed a floater that would have sent the game into overtime. Kemba Walker had 21 points for the Hornets (31-39), who have dropped four of their last five and continue to fall out of playoff contention. The 76ers won despite their bench getting outscored 61-14. ROCKETS 121, HAWKS 105: James Harden had 31 points and 10 assists, Clint Capela added 26 points and 11 rebounds and visiting Houston won its third straight game. GRIZZLIES: Guard/forward C.J. Miles is expected to miss the remainder of the season after injuring his left foot over the weekend. BUCKS: The Bucks signed guard Tim Frazier, a former Red Claw, as they try to shore up their backcourt with Malcolm Brogdon out indefinitely with a plantar fascia tear in his right foot. Frazier, 28, played 47 games this season for the New Orleans Pelicans and averaged 5.0 points, 4.4 assists and 2.9 rebounds in 19.3 minutes per game. He was waived Feb. 28. CLIPPERS: Doc Rivers denied rumors that he’s interested in leaving the Los Angeles Clippers to coach the Lakers. The LeBron James-led Lakers are 31-39 under Coach Luke Walton, whose job status is widely believed to be in jeopardy. Fueling the speculation involving Rivers is that he is close friends with Magic Johnson, Lakers president of basketball operations. However, Rivers said that’s being replaced with a long-term deal.